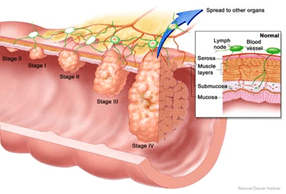 Who is at increase risk of getting bowel cancer? Approximate risk over the next…. Bowel cancer or polyps may bleed silently for several years. The only way to find this silent bleeding is with a FOBT stool test. On a 15 year program, it decreases your chance of dying from bowel cancer 1% per year if you check a FOBT every 2 years and 2% per year if done annually. Namely, it is proven to decrease bowel cancer death by 15% if repeated every 2 years or 30% if repeated annually over 15 years respectively. positive FOBT = bowel cancer only 3-5%. All positive FOBTs need colonoscopy to investigate cause. negative test does not exclude polyps or cancer in 100%. This is a common choice in the UK. Is bowel screening for me? Over 70% of Australians have probably had some form of bowel cancer screening. currently over 60% (even when offered FOBT screening) do not take it up. This is partly why we have not seen a significant decrease in bowel cancer deaths in Australia since the 1960s. Many people who come to a specialist favour colonoscopy every 10 years (or every 5 years if there is a family history). There are also many who choose the less invasive, convenient FOBT stool test at home every year (or two). Screening for bowel cancer, when you feel well, have no symptoms and have no family member with bowel cancer, is a preventative health decision. Talk your decision over with your doctor. Encourage the people close to you over 50 to do the same. Each option has a set of benefits and risks. None is 100% accurate. Any form of bowel cancer screening may save your life or a loved one and is better than waiting until it is too late. … then you are at significant risk for bowel cancer. “Deaths from bowel cancer have not fallen much since the 1960s.